Su, X., Liu, L., Zhang, Y., Liao, Q., Yu, Q., Meng, R., and Yao, J. (2017). "Efficient removal of cationic and anionic dyes from aqueous solution using cellulose-g-p(AA-co-AM) bioadsorbent," BioRes. 12(2), 3413-3424. The removal of cationic methylene blue (MB) and anionic acid red 1 (AR1) dyes from aqueous solution was studied using cellulose-g-p(AA-co-AM) bio-adsorbent (CP bio-adsorbent). The CP bio-adsorbent with surface multiple functional groups and macroporous network structure was synthesized via grafting the acrylic acid (AA) and acrylamide (AM) onto cellulose molecules. The adsorption behavior of the bio-adsorbent to dyes in the aqueous solution was studied. The effects of solution pH, temperature, initial dye concentration, and contact time on the adsorption capacity of the bio-adsorbent were investigated. Due to the abundant functional groups and macroporous network structure, the CP bio-adsorbent exhibited remarkable adsorption performance for the removal of type dyes with an equilibrium adsorption capacity of 998 mg·g-1 for MB and 523 mg·g-1 for AR1. The kinetic studies revealed that the adsorption of dyes was exactly described by a pseudo-second-order kinetic model. Comparison with other bio-adsorbents confirmed that the eco-friendly CP bio-adsorbent possessed excellent potential for water purification. Water pollution is a crucial environmental issue that receives worldwide attention. As one of the main pollutants, dyes are toxic, non-biodegradable, and even carcinogenic, which create serious threats to aquatic organisms and human health. Hence, the efficient removal of dye pollutants from wastewater into an acceptable level before discharging into the natural environment is necessary. During the past three decades, various physical, chemical, and biological treatment methods have been reported for dyes treatment, such as coagulation, membrane filtration, chemical oxidation, electrodialysis, photodegradation, and adsorption (Singh and Arora 2011). Of these, the adsorption method is a simple, competitive method for dye removal. The development of new adsorbents with high loading capacity and high rate of uptake play a key role in the removal of toxic dye molecules. Carbon nanomaterials and graphene are newly developed and efficient adsorbents for the removal of pollutants in air and wastewater (Zhuang et al. 2016) systems. However, the relatively low density of functional groups, the higher production cost, and regeneration difficulty of the materials used limit their widespread practical applications. Therefore, the development of high-efficient, green, sustainable, and cheaper adsorbents based on natural materials is a subject of intensive research (Crini and Badot 2008). Cellulose is the most abundant polysaccharide found in nature, and it is a non-toxic and low cost material that is biocompatible, biodegradable, and renewable. Due to its unique features, cellulose can directly adsorb dyes; however, the adsorption capacity of pure cellulose is fairly low. Recently, many investigators have tried to develop functional (such as carboxyl, amino, sulfo group, and cyclodextrin functional) cellulose-based materials to enhance the dye adsorptive property. For example, Gopakumar et al. (2017) synthesized meldrum’s acid modified cellulose nanofiber-based polyvinylidene fluoride microfiltration membrane via nonsolvent assisted methodology, which was found to adsorb 4 mg·g-1 from 10 mg·L-1 crystal violet aqueous solution. The carboxylate-functionalized cellulose nanocrystals were demonstrated to have the effective removal capacity for cationic dyes (Qiao et al. 2015). Yu et al. (2016) studied carboxylated cellulose nanocrystals for their use as cationic dye adsorbents. Wang et al. (2016) synthesized polyacrylamide grafted quaternized cellulose by an inverse emulsion method, and the product was able to adsorb Eriochrome blue SE and Congo red dyes at the level of 349 mg·g-1 and 380 mg·g-1, respectively. Moreover, surface quaternized cellulose nonfibrils exhibited good dye adsorption capacity and recyclability (Pei et al. 2013). Among them, these functional modified (carboxylic, amino, and quaternary functional modified) cellulose-based nanofibers or nanocrystals showed enhanced adsorption of dye molecules. However, the separation of rod-like nanowhiskers or long cellulose nano-fibers from native cellulose usually consumes more energy and produces more pollutants. Hence, it remains a great challenge to fabricate functional adsorbents with facile, economic, and highly efficient dye adsorption capacity based on native cellulose. In this study, a functional cellulose-based bio-adsorbent with efficient dye adsorption capacity was prepared using chemical polymerization process. A cellulose-g-p(AA-co-AM) (CP) bio-adsorbent with multiple surface functional groups and a macroporous network structure was synthesized through grafting of acrylic acid (AA) and acrylamide (AM) molecules onto cellulose molecules. 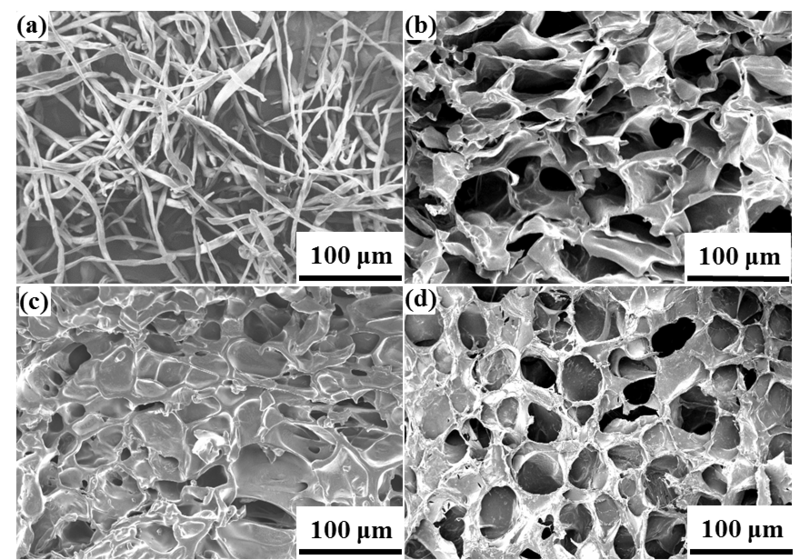 Although cellulose-based adsorbents for environmental removal have been reported, there are few reports showing a correlation between the structural features of cellulose-based adsorbents and adsorptive properties. The purpose of the present work was to synergize the combination of the presence of carboxyl, amino, and hydroxyl functional groups, and a macroporous network structure to enhance the adsorption capacity and favor the widespread use of cellulose for dyeing wastewater remediation. Two organic dyes (methylene blue (MB) and acid red (AR1)) were used as model pollutants to investigate the adsorption characteristics of CP bio-adsorbent in aqueous solution. The chemical structures and molar masses of MB and AR1 are shown in Table 1. The structural characteristics of CP bio-adsorbent, their recyclability, and the effect of pH, temperature, initial dye concentration, and contact time on adsorption behavior and adsorption kinetics for dye molecules were investigated. The results showed that the CP bio-adsorbent was a desirable adsorbent that has a practical and potential effect in the treatment of environmental remediation. Cotton linter with fiber length 2 to 3 mm containing more than 95% α-cellulose was purchased from Heze Sanmu Health Materials Co. Ltd. (Shandong, China) and used without any further milling. Methylene blue (MB) and acid red 1 (AR1) were purchased from Aladdin Industrial Co. Ltd. (Shanghai, China) and used without any further purification. Acrylic acid (AA), acrylamide (AM), anhydrous ethanol, N,N’-methylenebisacrylamide (MBA), and ammonium persulfate (APS) used were all analytical grade reagents and were provided by Sinopharm Chemical Reagent Co. Ltd. (Shanghai, China). The CP bio-adsorbent was prepared by grafting AA and AM monomers on cellulose macromolecular chain through free-radical copolymerization, as previously described (Su et al. 2016). Briefly, 2 g of cotton linter was dissolved in 66 g of a mixed aqueous solution of 12 wt% urea/7 wt% NaOH to obtain a cellulose solution. About 0.2 g of APS was dissolved in 1 mL of distilled water before use, and it was then added into the cellulose solution to produce free radicals by stirring for 5 min at room temperature. Afterward, 10 g of AA, 2 g of AM, and 0.06 g of MBA were added. The reaction was carried out for 24 h at -18 °C to finish the polymerization. The obtained gels were washed with distilled water and ethanol three times to remove the residual monomers. All samples used for the adsorption test were dried overnight at 60 °C. Finally, the dried products were milled through a screen with 30 to 40 mesh before adsorption tests. The surface morphologies of the gold-plated products were imaged using a field emission scanning electron microscope (FESEM, JSM-6701F, JEOL, Tokyo, Japan) and scanning electron microscopy (SEM, JSM-5610, JEOL, Tokyo, Japan). The chemical structures of the cellulose, CP bio-adsorbent, dye-loaded CP bio-adsorbent, and the two dyes were analyzed utilizing a Fourier transform infrared spectrometer (FTIR, Nicolet-5700, Thermo Electron Corp., Waltham, MA, USA) with a flat-plate attenuated total reflectance accessory in the range of 400 to 4000 cm-1. The overall content of carboxyl groups (-COO–) and amino group (-NH2) of dried CP bio-adsorbent was obtained by chemical titration method (902 titrator Metrohm, Hongkong, China) (Saito and Isogai 2004; Atia et al. 2008). where C0 (mg·L-1) and Ct (mg·L-1) were the initial and “t” time concentrations of dye in solution, respectively. where qe represent the adsorption capacity of CP bio-adsorbent at equilibrium. The qt (mg·g-1) is the adsorption amount at time “t” (min); k1 (min-1), k2 (g·mg-1·min) are the rate constants of pseudo-first-order kinetic model and pseudo-second-order kinetic model, respectively. The recyclability and reuse of the adsorbents are crucial criteria for their practical applications. Because of its macro structure, the CP bio-adsorbent was easily separated after the adsorption experiment. It was found that 50% ethanol can be applied as desorption agent to regeneration the MB and AR1 from the bio-adsorbent under agitating at room temperature for 1 h (Qiao et al. 2015). To realize the recyclability of the bio-adsorbent, consecutive adsorption-desorption recycles were carried out five times. The CP bio-adsorbent was synthesized by free radical graft copolymerization. The strategy is presented in Fig. 1. The functional groups such as −COO− and −CO−NH2 groups were grafted in the cellulose skeleton by using AA and AM monomers. Compared with the fibrous cotton cellulose (Fig. 2a), the modified CP bio-adsorbent displayed properties of a 3D network; its macroporous structure and the pore size ranged from 50 to 100 μm (Fig. 2b). In Fig. 2c, the 3D porous structure was preserved after MB load and completely recovered after five times adsorption desorption cycles (Fig. 2d). The dye molecules were filled in the 3D pores via an intermolecular interaction. The CP bio-adsorbent with 3D porous structure showed favorable mass transfer performance and allowed adsorption on both surface and interior of the adsorbents, which is beneficial for higher adsorption capacity (Zhai et al. 2012). The FTIR analysis of cotton, CP bio-adsorbent, MB and AR1 dye-loaded CP bio-adsorbents, pure MB and pure AR1 samples showed the possible interaction sites between the CP bio-adsorbent and dye molecules (Fig. 3). 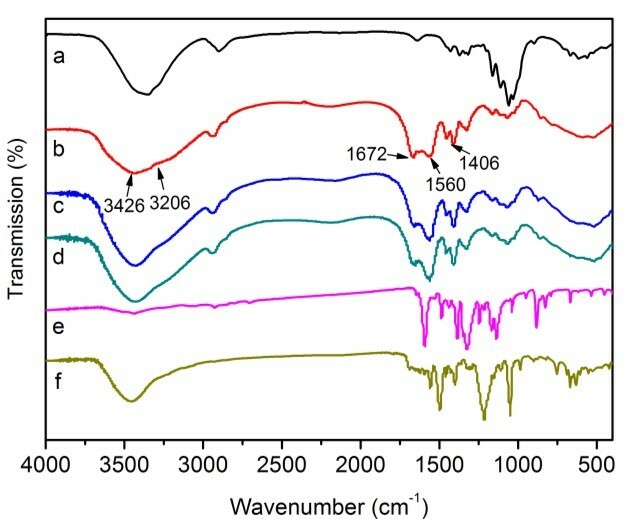 The raw cotton spectrum exhibited distinctive peaks at 3353, 2908, 1435, 1376, 1115, 1066, and 896 cm-1, which were the characteristic peaks of cellulose molecules (Liu et al. 2015; Zhang et al. 2015). After graft copolymerization modification, the characteristic peak at 3353 cm-1 shifted to a broadened peak at 3426 cm-1, which was attributed to the N–H stretching vibration and overlapping of O–H bonds. The new peak at 3206 cm-1 for CP bio-adsorbent was assigned to the newly formed –CO–NH2 and -OH groups. The peak at 2908 cm-1 showed a red shift. Moreover, the peak for C–H rocking vibration at 896 cm-1 was less intense. In addition, upon comparison with cellulose, the new peaks were found at 1672, 1560, and 1406 cm-1 in the spectrum of CP bio-adsorbent. Thus, the monomers (AA and AM) were successfully grafted onto the cellulose molecular skeleton, which provided more adsorption sites for dye adsorption (Eskandarian et al. 2014; Ho et al. 2016; Liu et al. 2015). Furthermore, according to the chemical titration method (Saito and Isogai 2004; Atia et al. 2008), the contents of 5.5 mmol·g-1 for carboxyl groups and 2.7 mmol·g-1 for amino groups were estimated on the CP bio-adsorbent sample. Moreover, the FTIR analysis of the CP bio-adsorbent and dye loaded CP bio-adsorbent showed the possible interaction sites in the dye molecules and the bio-adsorbent. Compared with the spectra of CP bio-adsorbent, the typical peak for the dyes loaded CP bio-adsorbent was shifted and broadened slightly (Figs. 3c and d). This indicated the electrostatic and hydrogen bonding interactions between the functional groups of bio-adsorbent and the dye molecules. The possible interactions between the CP bio-adsorbent and the dye molecules are shown in Fig. 4. 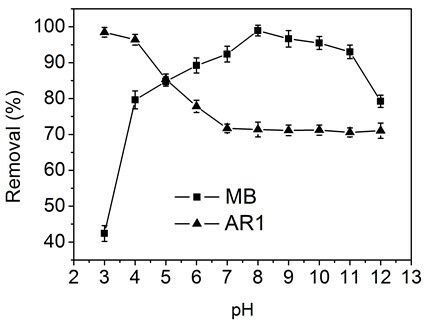 Figure 5 shows the influence of solution pH values (3 to 12) on the adsorption of MB and AR1 dyes by CP bio-adsorbent. The solution pH considerably affected the adsorption behavior, as the pH can affect the ionization condition of the functional groups in the bio-adsorbent. In case of MB, the adsorption of MB was increased with rising pH within the range 1 to 8, and then it decreased at basic pH values 8 to 12. At lower pH values, most of the –COO– and -NH2 groups were protonated into −COOH and −NH3+ groups, and the abundant presence of H+ ions on the surface of the adsorbent compete with the MB cationic dye molecules, resulting in low dye adsorption. In the alkaline solution, the CP bio-adsorbent was deprotonated, and the adsorption was increased due to the electrostatic interaction between the bio-adsorbent and MB dye molecules (Ghorai et al. 2014). The adsorption of AR1 on the CP bio-adsorbent was higher at low pH, and it decreased with increasing pH value. These anionic dye molecules in acidic conditions can easily be adsorbed by the modified CP bio-adsorbent, as the –NH2 functional groups present would undergo protonation to NH3+ ions and consequently interact with the anionic dye molecule. Fig. 5. Effect of pH values on the adsorption capacity of CP bio-adsorbent to MB and AR1 dyes. As shown in Fig. 6a, the effect of temperature on adsorption capacity of CP bio-adsorbent for MB and AR1 dyes were evaluated in each applicable temperature range (15, 25, 37, 45, and 60 °C). The adsorption capacity of the CP bio-adsorbent decreased slightly from the temperature 15 to 60 °C. For MB, the absorption capacity decreased from 998 to 794 mg·g-1, and for AR1 from 523 to 441 mg·g-1. By comparison, a maximum absorption capacity of 998 and 523 mg·g-1 was observed for MB and AR1, respectively, at 25 °C. The remarkable reduction of the dye adsorption capacity at temperature > 25 °C was attributed to the rapid desorption behavior mainly caused by the increased thermal motion (Tang et al. 2012). Hence, the temperature was kept constant at 25 °C for later experiments during this work. Fig. 6. 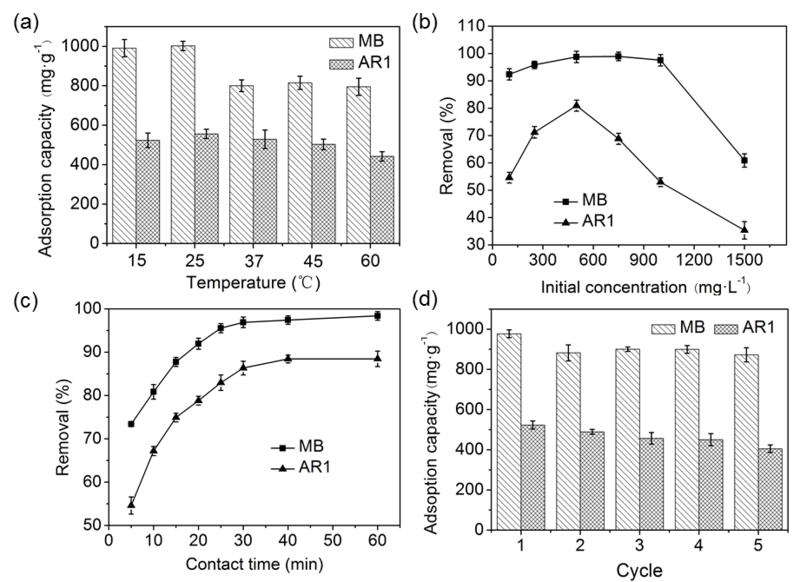 Effect of temperature (a), initial concentration (b), and contact time (c) on the adsorption performance of CP bio-adsorbent to MB and AR1 dyes. (d) Represents the recyclability of CP bio-adsorbent for MB and AR1 dyes adsorption after five adsorption–desorption cycles. As shown in Fig. 6b, the dye removal increased from 92.40% to 98.95% with an increase in MB concentration from 100 to 1000 mg·L-1, beyond which it decreased to 60.89% at 1500 mg·L-1. In the case of AR1, the corresponding increase was from 54.59% to 80.92% with concentration from 100 to 500 mg·L-1, beyond which it decreased to 35.34% at 1500 mg·L-1. This trend might be explained by the fact that plenty of vacant active sites were available for the adsorption at a lower dye concentration, and the saturated sites had difficulty to capture the dye molecules (Eskandarian et al. 2014). As for MB dye, the removal efficiency was higher than AR1, which probably was due to the smaller spatial prohibition in the molecular structure of MB and this positive feature makes the adsorption sites of CP bio-adsorbent more accessible to the dye (Ho et al. 2016). By contrast, the decrease in the removal rates of MB and AR1 dyes when the initial concentration was more than 900 mg·L-1. This can be explained by the saturation of the active adsorption sites at higher dye concentrations, consequently reducing the dye removal on the CP bio-adsorbents. Similar results were reported previously (Mahmoodi 2011). Figure 6c shows that the initial dye removal rate of the CP bio-adsorbent increased rapidly within 30 min, and then reached adsorption equilibrium at 30 min for MB and 40 min for AR1. This was mainly attributed to the fast electrostatic attraction between adsorbates and the adsorbent surface, which contains more functional groups with large substantial adsorption sites, as presented in Fig. 4. After the initial period, the adsorption curves became smooth and constant. It is because of the slower chemical interactions and intermolecular forces which make adsorbates become immobilized. To obtain full adsorption equilibrium, 1 h was selected in this study for the further investigation of MB and AR1 dyes. Furthermore, two kinetic models i.e., the Lagergren pseudo-first-order and the pseudo-second-order kinetic models are employed to investigate the possible rate-controlling steps and the adsorption mechanism (Tao et al. 2016). The pseudo-first-order and pseudo-second-order kinetics from the fitting plots with the coefficients of determination and model parameters are listed in Table 2. The values of R2 (R2 = 0.9997 for MB, R2 = 0.9991 for AR1) from the pseudo-second-order kinetic model were found to be over 0.999, making them higher than pseudo-first-order kinetic model (R2 = 0.9493 for MB, R2 = 0.9036 for AR1) in various contact times. Meanwhile, the theoretical adsorption capacities (qe) were much closer to the experimental adsorption capacities. These results also suggest the applicability of pseudo-second-order kinetic model. k1 and k2 are the rate constants of pseudo-first-order kinetic model and pseudo-second-order kinetic model, respectively; qe represent the adsorption capacity of CP bio-adsorbent at equilibrium; R2 is the fitting coefficient. Table 3 shows a comparison of the equilibrium adsorption capability of CP bio-adsorbent for MB with other biomass adsorbents reported in the literature. Due to the abundant functional groups and macropores network, the CP bio-adsorbent showed a greater adsorption capability in comparison with other biomass adsorbents. These results indicated the potential use of the CP bio-adsorbent in practical applications for the removal of dyes from wastewater streams. The recyclability and reuse of adsorbents are crucial for their practical applications. As indicated in Fig. 6d, the adsorption capacity declined slightly when the adsorption-desorption cycles were increased; the dye adsorption capacity of adsorbents to MB after one and five cycles was 998 mg·L-1 and 872 mg·L-1, respectively, while that of AR1 was 523 mg·L-1 and 405 mg·L-1, respectively. Thus, the CP bio-adsorbent showed excellent recycling ability for the treatment of the MB and AR1 dyes from aqueous solutions. The CP bio-adsorbent was designed and synthesized to remove cationic and anionic dyes. The modification of cellulose with AA and AM monomers was found to increase its adsorption sites, thus resulting in an increased dyes adsorption capacity. The newly formed macroporous network was beneficial to the diffusion of dye molecules into the 3D structure, leading to excellent dye removal efficiency. Moreover, the adsorption of the dyes by CP bio-adsorbent fit well into the pseudo-second-order kinetic model. The investigation of the adsorption behavior revealed that the adsorption process was mainly dominated by the electrostatic interactions between the dye molecules and the bio- The CP bio-adsorbent possessed remarkable adsorption capacity according to a comparison with other biomass adsorbents. In addition, the CP bio-adsorbent could be regenerated in a facile manner and it was shown that it retained high adsorption capacity after five times adsorption and desorption cycles. Therefore, the functional macroporous CP bio-adsorbent could be regarded as a promising adsorbent in wastewater treatment. The work is financially supported by the National Natural Science Foundation of China (51303159, 51672251) and the Program for the Zhejiang Top Priority Discipline of Textile Science and Engineering (2013YXQN06). Article submitted: November 16, 2016; Peer review completed: February 2, 2017; Revised version received and tentatively accepted: March 2, 2017; Published: March 21, 2017.